Mr. McMillan-Scott first heard about Ms. Zhang when he met her husband, Mr. Niu Jinping, and another practitioner, Mr. Cao Dong, seven years ago in Beijing. After learning of the horrific persecution of Falun Gong in China, he began to dedicate himself to rescuing Ms. Zhang. In 2011, Ms. Zhang and Mr. Niu were finally able to flee to the U.S. The Beijing police arrested Mr. Cao for the sixth time on June 8, 2012, and sentenced him to two and half years of forced labor. Ms. Zhang was an official with the Guangda Group Ltd and a chartered CPA. She made a good living and was afforded all the privileges of a modern, professional Chinese. In 1997 she and her husband started to practise Falun Gong. They gained good health and a deep sense of inner peace. When the Chinese Communist Party (CCP) launched a full-scale persecution of Falun Gong in 1999, everything changed. On May 21, 2006, Mr. Niu had the opportunity to meet with Mr. McMillan-Scott, who was visiting China. He told how his wife, Ms. Zhang, had been tortured. Mr. McMillan-Scott made the details of Ms. Zhang’s situation known to the world, and Mr. Niu was put under surveillance. Ms. Zhang was released from Beijing Women’s Forced Labor Camp on December 13, 2007, and wrote a letter to Mr. McMillan-Scott and the Human Rights Commission of the European Parliament. In her long letter, she listed over 50 methods of torture used on her. Mr. McMillan-Scott put it on the Parliament website, which is available to the international community. Ms. Zhang and her husband were sentenced to two and half years of forced labor on May 13, 2008, because of the approaching Beijing Olympics. Mr. Niu was taken to Tuanhe Force Labor Camp in Beijing. He was beaten until his teeth loosened. In July, Ms. Zhang was secretly transferred from Beijing Women’s Forced Labor Camp to Masanjia Forced Labor Camp in Shenyang City, Liaoning Province. Ms. Zhang protested with a hunger strike. A female guard pried her mouth open with a spoon and handcuffed her. The guard many times hung her up in the air by attaching the handcuff to a high metal bar high. Once she was hung up for three days straight and had to crawl out of the room because her arms and legs were injured and numb from the torture. She was also shocked with electric batons, forced to stand for long periods of time, and struck with wooden bats numerous times. Ms. Zhang refused to follow the prison rules, sign her “evaluation,” or wear a name tag. She also refused to eat. As a result, she was severely beaten. Her hands no longer functioned normally as a result. In 2009, she was transferred to a special section for worse torture. Mr. McMillan-Scott learned about her situation and again told the world how she was suffering. Ms. Zhang said that when she was arrested and taken to a forced labor camp, her child was a year and a half. The camp played the sound of a child crying around the clock at high volume. She was locked in a narrow, solitary cell. “If I did not practice Falun Gong, I would have lost my mind,” she said. Ms. Zhang recalled that, in the camp, she was repeatedly deprived of air until she passed out. She said she was not afraid of death; the constant struggle for life was worse than that. Instigated by the guards, the prisoners held her down and covered her mouth and nose with a damp cloth many times. They only removed it when she was suffocating. When she gasped for breath, they immediately covered her mouth and nose again. This was repeated over and over until she lost control of her bowels. Many of the practitioners who are in the camp now are still being tortured this way. Mr. McMillan-Scott asked Ms. Zhang about her health. He told her about how, when her husband told him about the torture she endured, he was in shock. McMillan-Scott visited over 40 countries, and, wherever he went, he mentioned their names. He also said that, to this day, he still worries that his effort to expose the persecution of Ms. Zhang was what caused them to suffer worse torture in China. He also worries that his attention to Mr. Cao Dong’s case will cause him to be more relentlessly persecuted. The Beijing police arrested Mr. Cao for the sixth time on June 8, 2012. Mr. Cao graduated from Beijing Foreign Studies University and met Mr. McMillan-Scott six years ago. He told McMillan-Scott about the persecution that he, his wife, and many Falun Gong practitioners were enduring. Two hours later, Domestic Security officers arrested Mr. Cao and put him in prison for five years. His wife, Ms. Yang Xiaojing, died on October 1, 2009, as a result of long term imprisonment, harassment, and being destitute during the persecution. 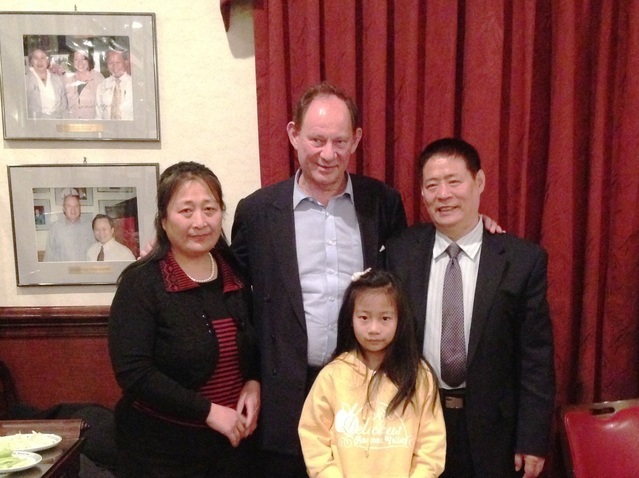 Mr. McMillan-Scott said that he believed the CCP’s persecution of Falun Gong wouldn’t last much longer.